In my most recent post, I promised readers a brief look back at the first five Whiskey Mattimoe mysteries and then a sneak-peek at the brand new book, Whiskey and Soda, due out next month. Still reeling from her husband's sudden death, 33-year-old Whiskey Mattimoe has her hands full managing her real estate business and keeping track of Chester, the 8-year-old son of a touring pop music star. And then there's Abra, an Afghan hound with a diva attitude and a penchant for stealing designer purses. When someone turns up dead at one of Whiskey's rental properties, the Magnet Springs part-time police force needs all the help it can get. This quiet Lake Michigan resort town is known for its mysterious magnetic fields, not murder, and the locals would like to keep it that way. 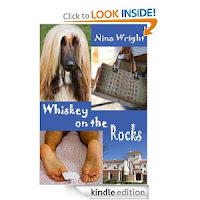 At her own peril, Whiskey uncovers art theft, forgery, and some nasty dark secrets. Bold and street smart, Whiskey can take care of herself--with the aid of an exceptionally well-trained "rott hound" who happens to have a crush on Abra. But to survive, she's got to untangle a web of deceit before it kills her business, and just possibly Whiskey, as well. Getting the critics on your side is important, but it's what readers say or post online that matters most. I'm thrilled to answer questions about the series. Most often readers want to know what inspires me to write about (a) a woman who can't control her dog, and (b) a dog like Abra, specifically, a felonious Afghan hound with an unbridled libido. Is Whiskey like me? Is Abra like any dog I've ever shared my life with? The answers, as you might expect, are a combination of yes and no--which is why they call what I make fiction. I once shared a house with a woman who thought she "owned" an Afghan hound, the most glorious, graceful, gravity-defying breed of dog I've ever met. Many years later, while living in rural Michigan, I rescued a pregnant scent hound; she reserved her slavish affection for my ex, who never cared for her. That hound also had a predilection for running away and getting into mounds of trouble, which I single-handedly sorted out time and again. Combining those canine experiences with a healthy dash of narrative imagination yielded Whiskey Mattimoe and Abra the Afghan hound. My abiding love for the west coast of Michigan is also a feature of this series. Many of my happiest days so far have been spent on the beaches and in the quaint towns that line the greatest of Great Lakes. So imagine my delight in realizing that the newest Whiskey Mattimoe book will be available in print and digital formats just in time for beach season! I highly recommend Michigan's dunes and resort towns. If you can't get there in reality, I hope you'll visit via my fiction. Coming up: Where Whiskey has been, and where she's going. . . . .